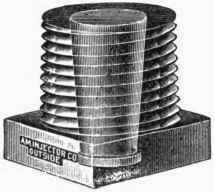 A drawing of a fusible plug, showing the tapered core. For the spillway in dams, see fuse plug. A fusible plug is a threaded metal cylinder usually of bronze, brass or gunmetal, with a tapered hole drilled completely through its length. This hole is sealed with a metal of low melting point that flows away if a pre-determined, high temperature is reached. The initial use of the fusible plug was as a safety precaution against low water levels in steam engine boilers, but later applications extended its use to other closed vessels, such as air conditioning systems and tanks for transporting corrosive or liquefied petroleum gasses. A modern fusible plug. The core of low melting-point metal is visible. A fusible plug operates as a safety valve when dangerous temperatures, rather than dangerous pressures, are reached in a closed vessel. In steam engines the fusible plug is screwed into the crown sheet (the top plate) of the firebox, typically extending about an inch (25mm) into the water space above it. Its purpose is to act as a last-resort safety device in the event of the water level falling dangerously low: when the top of the plug is out of the water it overheats, the low-melting-point core melts away and the resulting noisy release of steam into the firebox serves to warn the operators of the danger before the top of the firebox itself runs completely dry, which could result in catastrophic failure of the boiler. The temperature of the flue gases in a steam engine firebox can reach 1000 °F (550 °C), at which temperature copper, from which historically most fireboxes were made, softens to a state which can no longer sustain the boiler pressure and a severe explosion will result if water is not put into the boiler quickly and the fire removed or extinguished. The hole through the plug is too small to have any great effect in reducing the steam pressure and the small amount of water, if any, that passes through it is not expected to have any great impact in quenching the fire. The device was invented in 1803 by Richard Trevithick, the proponent of high-pressure (as opposed to atmospheric) steam engines, in consequence of an explosion in one of his new boilers. His detractors were eager to denounce the whole concept of high-pressure steam, but Trevithick proved that the accident happened because his fireman had neglected to keep the boiler full of water. He publicised his invention widely, without patent, to counter these criticisms. Experiments conducted by the Franklin Institute, Boston, in the 1830s had initially cast doubt on the practice of adding water as soon as the escape of steam through the device was noted. A steam boiler was fitted with a small observation window of glass and heated beyond its normal operating temperature with the water level below the top of the firebox. When water was added it was found that the pressure rose suddenly and the observation glass shattered. The report concluded that the high temperature of the metal had vaporised the added water too quickly and that an explosion was the inevitable result. It was not until 1852 that this assumption was challenged: Thomas Redmond, one of the Institute's own inspectors, specifically ruled out this theory in his investigation into the boiler explosion on the steam ship Redstone on the Ohio River on 3 April that year. A 1907 investigation in Wales came to a similar conclusion: a steam locomotive belonging to the Rhymney Railway was inadvertently sent out with its safety valves wrongly assembled. The pressure in the boiler built up to the extent that the injectors failed; the crown sheet became uncovered, was weakened by the heat of the fire and violently blew apart. The investigation, led by Colonel Druitt of the Railway Inspectorate, dismissed the theory that the enginemen had succeeded in starting the injectors and that the sudden flood of cold water had caused such a generation of steam that the boiler burst. He quoted the results of experiments by the Manchester Steam Users' Association, a national boiler certification and insurance body, that proved that the weight of copper present (considered with its specific heat) was insufficient to generate enough steam to raise the boiler pressure at all. Indeed, the addition of cold water had caused the pressure to fall. From then on it was accepted that the correct action in the event of the operation of the fusible plug was to add water. The original design was a simple solid plug filled with a slug of low-melting-point alloy. When this melts, it first melts as a narrow channel through the plug. Steam and water immediately begins to escape through this. The cored fusible plug was developed in the 1860s to give a wide opening as soon as the alloy softens. This version has a solid brass or bronze centre, soldered into place by a layer of the low-melting-point alloy. When overheated, the plug does not release any steam or water until the alloy melts sufficiently to release the centre plug. The plug now fails dramatically, opening its entire bore immediately. This full-bore jet is then more likely to be noticed. A drawback to the device was found on 7 March 1948, when the firebox crown sheet of Princess Alexandra, a Coronation Pacific of the London, Midland and Scottish Railway, failed while hauling a passenger train from Glasgow to London. Enquiries established that both water gauges were defective and on a journey earlier that day one or both of the fusible plugs had melted, but this had gone unnoticed by the engine crew because of the strong draught carrying the escaping steam away from them. Investigation showed the importance of the alloy on plug ageing. Alloys were initially favoured as they offered lower eutectic melting points than pure metals. It was found though that alloys aged poorly and could encourage the development of a matrix of oxides on the water surface of the plug, this matrix having a dangerously high melting point that made the plug inoperable. In 1888 the US Steamboat Inspection Service made a requirement that plugs were to be made of pure banca tin and replaced annually. This avoided lead and also zinc contamination. Zinc contamination was regarded as so serious a problem that the case of the plugs was also changed from brass (a copper-zinc alloy) to a zinc-free copper-tin bronze, to avoid the risk of zinc migrating from the housing into the alloy plug. In the 1920s investigations by the U.S. Bureau of Standards, in conjunction with the Steamboat Inspection Service, found that in use encrustation and oxidation above the fusible core can increase melting point of the device and prevent it from working when needed: melting points in excess of 2000 °F (1100 °C) in used examples have been found. Typical current practice in locomotives requires new plugs to be inspected after "15 to 30 working days (dependent upon water condition and use of locomotive) or at least once every six months," depending on the boiler operating pressure and temperature. The principle of the fusible plug is also applied to the transport of liquefied petroleum gases, where fusible plugs (or small, exposed patches of the containers' lining membrane) are designed to melt or become porous if too high a temperature is reached: a controlled release, at a typical temperature of 250 °F (120 °C), is preferable to an explosive release (a "BLEVE") at a higher temperature. Corrosive gas containers, such as those used for liquid chlorine, are fitted with one or more fusible plugs with an operating temperature of about 158 to 165 °F (70–74 °C). Fusible plugs are common in aircraft wheels, typically in larger or high-performance aircraft. The very large thermal loads imposed by abnormal landing and braking conditions (and RTO notably) can cause already high pressure in the tyres to rise to the point that the tyre might burst, so fusible plugs are used as a relief mechanism. The vented gas may be directed to cool the braking surfaces. Fusible plugs are sometimes fitted to the receivers of air compressors as a precaution against the ignition of any lubricating oil vapour that might be present. Should the action of the compressor heat the air above a safe temperature the core will melt and release the pressure. Automobile air conditioning systems were commonly fitted with fusible plugs, operating at 100–110 °C, but from concerns about the environmental effects of any released refrigerant gas this function has been taken over by an electrical switch. A patented (Patent published 1867) type of fireproof safe uses a fusible plug to douse its contents with water if the external temperature gets too high. Wikimedia Commons has media related to Fusible plugs. ^ Staff (1957). "The Boiler: Boiler Mountings and Details". Handbook for railway steam locomotive enginemen. London: British Transport Commission. p. 53. ^ Snell, John (1971). "The beginning of steam power". Mechanical Engineering: Railways. London: Longman. p. 31. ISBN 0-582-12793-9. ^ Payton, Philip (2004). Trevithick, Richard (1771–1833). Oxford Dictionary of National Biography. Oxford University Press. ^ Kirby, Richard Shelton; et al. (1956). Engineering in History. New York: McGraw Hill. p. 176. ISBN 0-486-26412-2. OCLC 561620. ^ Staff of the Benjamin Franklin Institute of Technology (undated ca 1830): Steam-boiler explosions. Reprinted 2005 as Explosions of steam boilers. Scholarly Publishing Office, University of Michigan Library. ISBN 1-4255-0590-2. ^ "Improved fusible plug for steam boilers". Scientific American. New York: Munn and company: 158. 1 September 1866. ^ Hewison, Christian H. (1983). Locomotive Boiler Explosions. Newton Abbot, England: David & Charles. pp. 134–137. ISBN 0-7153-8305-1. ^ a b c Freeman, John R; Scherrer, J.A. ; Rosenberg, S. J (22 June 1929). "Research Paper 129: Reliability of Fusible Tin Boiler Plugs In Service". Bureau of Standards Journal of Research. Washington, DC: U. S. Department of Commerce. 4: 3. doi:10.6028/jres.004.001. ^ Rose, Joshua. Steam boilers: a practical treatise on boiler construction and examination. Philadelphia: H. C. Baird. p. 233. OCLC 3351379. ^ "The management of steam locomotive boilers" (PDF). Sudbury, Suffolk, UK: Health and Safety Executive. 2007. pp. 22, 33. ^ "Pressure container with thermoplastic fusible plug". United States Patent 4690295. Free Patents Online. 1987. Retrieved 2008-04-07. ^ White, George (2010). Handbook of Chlorination and Alternative Disinfectants (5 ed.). New York: Wiley. p. 26. ISBN 0-470-18098-6. ^ Taylor, David A. (1996). Introduction to marine engineering (2 ed.). Oxford, England: Butterworth Heinemann. p. 135. ISBN 0-7506-2530-9. ^ Daly, Steven (2006). Automotive air-conditioning and climate control systems. Oxford, England: Butterworth. p. 82. ISBN 0-7506-6955-1. ^ "Patent 72,176 Fireproof safe". Commissioner of Patents annual report. Washington, DC: United States Patent Office. 17 December 1867.